I got this Olimex MSP430-4619LCD board from SparkFun because 1) it had an MSP430 that has the MSP430X instruction set that I need to test my naken_asm assembler with and 2) it was on sale because I believe they aren't selling it anymore. Kind of a shame because it's a pretty decent board. My only complaints are the LCD doesn't look so nice, although that could be because it needs some adjustments, and also there aren't debug LED's or such. I was able to use msgdebug to upload my hexfiles through the TI FET when the code was small, but for some reason when I added my image and the hex file got big, this stopped working. I had to use the Olimex JTAG-TINY and the Olimex software to program it. 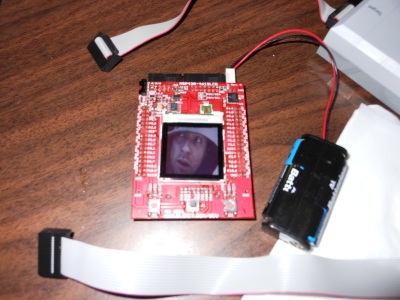 Here's the Olimex MSP430-4619LCD board with my face on it :).